2005-02-02. Good. Ships with Tracking Number! INTERNATIONAL WORLDWIDE Shipping available. May not contain Access Codes or Supplements. May be ex-library. Shipping & Handling by region. Buy with confidence, excellent customer service! Distributed by Crown Publishers. Hardcover. 0517020750 New Condition. . New. Distributed by Crown Publishers. Hardcover. 0517020750 Like New Condition. . Fine. Distributed by Crown Publishers, 1951-01-01. Very Good. Nice looking book, has minor edge wear.has small tears on the dust jacket. NY: Bonanza, 1951. Reprint. Quarto. 196 pp; numerous b/w photographs, floor plans. Cloth in dustjacket. VG/VG, a clean, unmarked copy; jacket lightly rubbed, light edgewear incl. 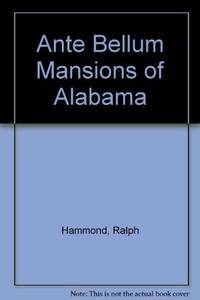 small loss at head of spine The author personally visited and studied over 300 ante-bellum mansions in Alabama; he selected the fifty finest antebellum houses to feature here.. Reprint. Hard Cover. Very Good/Very Good. The Ante-Bellum Mansions of Alabama. hardback. Very Good. Illustrated. Large 4to. NY (Bonanza) (1951). Light foxing along edges, else very good in rubbed dust wrapper. Distributed by Crown Publishers. Used - Good. Ships from the UK. Former Library book. Shows some signs of wear, and may have some markings on the inside. 100% Money Back Guarantee. Your purchase also supports literacy charities. Bonanza Books. 1951. Hardcover. UsedGood. Hardcover, with photographs by the author and plans by Edwin B. Lancaster; fading and shelf wear to exterior; corners bumped; otherwise in good condit ion with clean text, firm binding. .
New York: Bonanza. Good tight condition hardback in good dustjacket some edgewear. 1951. 4to. some discoloration to cover of book. From Larry McMurtry's Last Book Fair Archer City TX. August 2012 . Distributed by Crown Publishers, 1951-01-01. Hardcover. Very Good. Distributed by Crown Publishers, 1951. Hardcover. Good. Disclaimer:A copy that has been read, but remains in clean condition. All pages are intact, and the cover is intact. The spine may show signs of wear. Pages can include limited notes and highlighting, and the copy can include previous owner inscriptions. At ThriftBooks, our motto is: Read More, Spend Less.Dust jacket quality is not guaranteed.